If you hate listening to voicemail or getting interrupted by an unknown number ringing your phone during dinner, then you will love Google Voice. Google’s new phone product (which re-brands Google-acquired GrandCentral) makes dealing with voice communication less than awful. I’ve been a GrandCentral user for well over a year now, but Google Voice adds two key components that complete the must-have feature puzzle: voicemail transcription and SMS. Now that I can read (read!!) my voicemail and you can text message my Google Voice number, I’m making it my primary phone number. Alongside its awesome filters, Google Voice is essentially the Gmail of voicemail and phonecalls. Here’s what my Google Voice box looks like right now, and how I’m using it specifically. First I should explain why I’m so cranky about the phone. Like most introverted netizens who prefer textual communication, I hate listening to voicemail (and often will put it off for weeks). My personal hell includes holding a hot device to my ear while listening to someone “um” and “ah” for half an hour through information they could have just emailed me. I don’t have a land line or an office line; my one single phone number is my cell phone, which I carry all the time. As a result, if I want to get calls from my friends, it means any schmoe who I’ve ever given my number can make the device in my pocket ring and interrupt me wherever I am and whatever I’m doing. At the same time, the phone is obviously a necessary appliance in modern life, especially for people who like to receive paychecks from other people who don’t loathe the phone. I’m a text-messaging fool, and I’m not totally anti-social. I do love real-time voice communication with the people who matter to me, like friends and family. What’s cool about Google Voice (since it was GrandCentral), is that you can set up custom behaviors based on who’s calling. For example, my close friends’ calls can get forwarded directly to my cell phone. My co-workers’ calls can get forwarded to my cell phone only during business hours. Unknown callers can go straight to voicemail, or I can get the option to “screen” them–that is, listen in on their voicemail as they leave it and decide on the spot if I want to pick it up. That’s the catch, of course: if you switch to Google Voice, it means changing your number, which is a pain. But like a Gmail address or P.O. box, it’s a number you can give out freely without worrying that Annoying Guy is going to call your cell phone at 6AM for no good reason. There are two other minor annoyances about Google Voice. First, you have to associate your number with a Google Account, but it doesn’t yet support Google Apps accounts. This is important for Google Apps users to know because your Gmail account contacts become your Google Voice contacts. Second, sending an SMS from your cell phone that appears to come from your GV number doesn’t seem possible yet (unless I missed it). 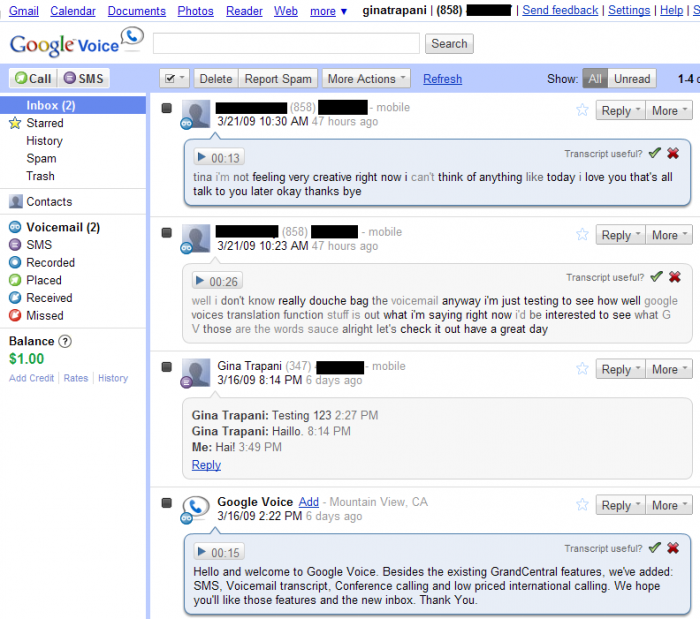 As Google Voice rolls out to the public, I expect iPhone/Android apps to come out soon which let you do that and more. Update: conedude13 points out Google Voice’s mobile site, which you can use to send text messages from your phone (though it’s more clumsy than your mobile’s built-in SMS app). Google is rolling out the Voice product to GrandCentral users now. Here’s their full blog post about it, and a treasure trove of how-to videos: Here comes Google Voice. I HATE voicemail too – something that everybody else thinks is weird – nice to know I’m not alone! One of your voicemails above is quite amusing. I wonder about them being able to give this away for free. If they make it free will they struggle with available phone numbers. I would imagine the number of people signing up for a free number and then never using the service might be quite high. Is there anything in the terms of service about how you could lose your number? I’ve been using GC for a while. I really like the ability to choose what annoying phone calls hear (I had a business call me at least 10 times one day and hang up when I answered, they went to my block list with the “number you called is not in service” style message, must have messed with their heads). The general ring everything has worked very well for me. The only downside, if you ring a skype account, the lag is really bad (if your skype account forwards to another number, it gets down right weird). The SMS (at least for me and my Sweetie’s iPhone) shows my Google Voice number. The response went right to my cell phone, albeit from a different number, and the response got routed back correctly (and saved in the inbox!). How cool would a Firefox addon be that allows me to click on a phone number on a web page and it rings on my cell phone? If Google Voice can translate to text. Then it should be able to send a user a twitter message. Now that would be cool. I would switch right away if I could port my cell number to GV, and get a new, private number for my cell. This is a google voice support page where people figured out that when you txt someone from GV, the 406 area-code # you get a reply from is permanently mapped to that contact (based on your number+406#). Therefore, you can save this 406# to your contact’s info, and everytime you want to txt the person (with your GV # showing), you just txt (or even CALL) the 406# (from any phone registered on your GV account) that is mapped to that contact and it appears as if you txted or called from your GV number. When you do get a text message FROM someone, you can save that (406) number and use it to text-message someone indefinitely! …what’d be awesome is Google Voice listing that number in their contact information as a “pager” number or something. Then I could just synch the contact info back to my phone. Can you select your phone number or does GV select one for you? I’m talking about area codes specifically. Awesome tip Joshua & Chris re: SMS from number, definitely going to try that out, thanks! Can you select your phone number or does GV select one for you? When I signed up for a GrandCentral invite way back when, I requested an area code and got it, yes. On gmail chat, if my wife sends me an SMS it comes from a 406# too. I have saved that number as a second mobile number for her and just send texts to the 406# when she’s at the computer (so it looks like a chat session). Seems that everyone could have their own 406 for Google Voice and Gmail SMS. Sounds very interesting, but I’m assuming this is only supported in the U.S. and in English? I live in Brazil and 99% of my voicemail is in Portuguese. You can use a Google Apps account but you must configure it as a Google Account first. I wrote a blog post on how to do this. 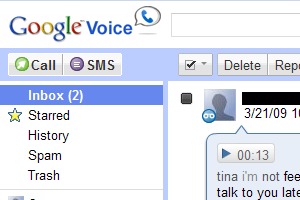 My Google Voice account is linked to my pure at srcasm dot com account. My biggest annoyance with google voice is related to my biggest annoyance with Grand Central: Grand Central was US only, so I never got onto their beta, so now I don’t have Grand Central OR Google Voice! Do you know if it’s possible for two people to add one phone to their account? It seems simple enough to architect, and really useful for the shared home phone. When you are eventually able to port your cell number to Google Voice, will you need a new cell number or can GV manage the cell and the GV connection together? Because, that would be nice. I am so glad I didn’t give up on my Grand Central account. The gripes I had with the previous service are obsolete with the release of Google Voice. I love it so far. Create a new contact and save this really long number in case I need to complain about more stray hairs in my food. I can’t wait to see more features added. Until then, this has become my new primary phone number. I currently use Google Sync to sync my iPhone with Goggle Apps contacts. I wish they would just let me combine my accoutns but that is a no go as of now. Does anyone know if there any script that would sync the contacts from the Goggle Apps contacts to Gmail contacts? Any ideas are much appreciated.